Is your brand eager to get into Instagram advertising? If you’re apart of the more than 1 million advertisers already using Instagram, are you spending too much on campaigns? Or do you have the most efficient targeting possible? Just about every marketer on social will have something to say. Whether it’s been “a success,” “it’s expensive” or “haven’t tried it just yet,” there’s still a lot of advertisers looking to learn more. According to a Q1 2017 report from 4C Insights, the total spend in social media advertising is up almost 62% year-over-year. How Much Does Instagram Advertising Cost? 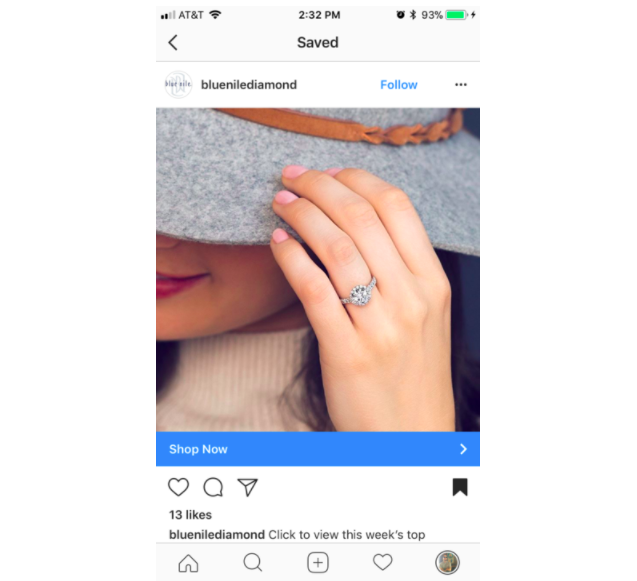 Instagram advertising costs depend on the mobile device you’re targeting, demographics, day of the week and whether or not it’s during a major televised event. It all comes down to your target audience, which is why it’s so important to learn your Instagram demographics. As you can see, women tend to be more active on Instagram than men. This results in higher CPC for targeting women-specific audiences. 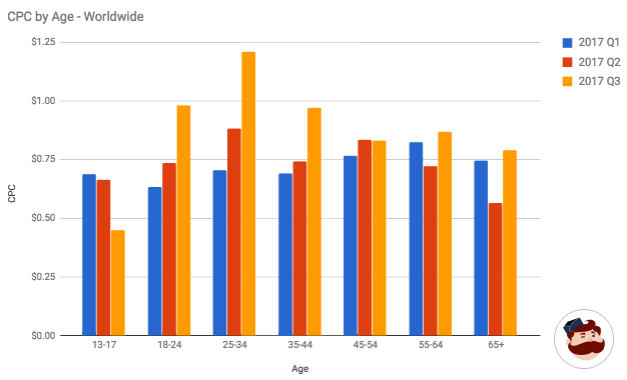 However, age demographics paint quite a different picture. 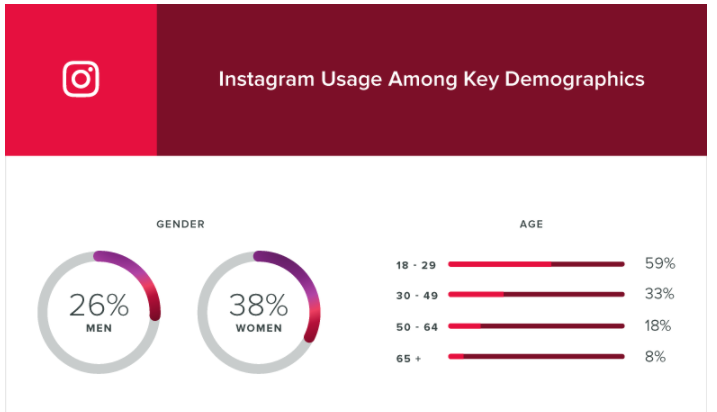 The majority of Instagram users are under the age of 50, but CPC isn’t as drastically different compared to gender. According to data from AdEspresso, the average cost per click (CPC) for Instagram ads in Q3 ranged between $0.70 and $0.80 for all age ranges. Obviously these CPC projections fluctuate depending on your campaign. For example, Instagram ad costs will likely rise during major events or holidays such as Black Friday, Christmas, Labor Day and Cyber Monday. 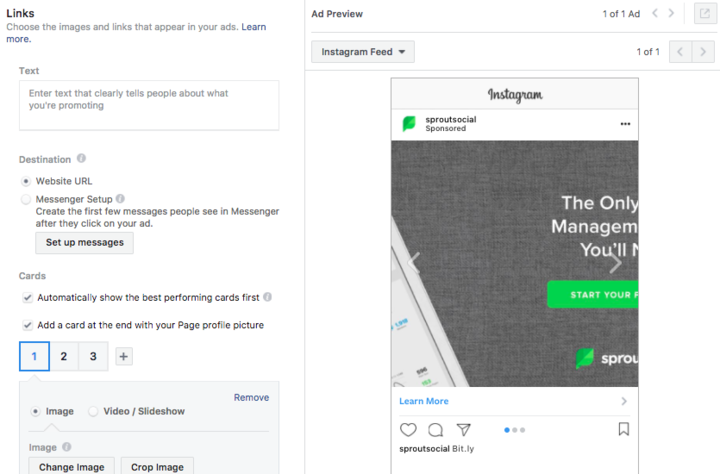 Now that we understand the various drivers of your CPC for Instagram ads, you can focus on creating optimized campaigns to get the most out of your budget. Brand Awareness: Ideal for reaching users who would engage with your ad and to bring general awareness around your brand. Reach: This is for brands trying to get ads in front of the most people possible. Traffic: If your goal is to get users to visit a site, landing page or app, a traffic goal is perfect. Engagement: If you want users to like, comment or share your ad, it’s best to set your objective to engagement. App Installs: This goal is for brands directing users to the app store to download or purchase apps. Video Views: In-stream ads play in users’ feeds to show production, product launches, and behind-the-scenes footage to visually entice users into watching. Lead Generation: Trying to simply find people interested or somewhat curious about your brand? Set a lead gen goal. Messages: This encourages users to interact with your brand to answer product questions, provide support or complete purchases. Conversions: If you’re looking for direct sales actions on your ads, such as adding payment info or making a purchase, conversions is the ideal goal. Product Catalog Sales: The format is for brands showing products from your product catalog (must set one up to use this format), which then targets your audience. Store Visits: This is perfect for those promoting multiple business locations to drive more in-store visits. When choosing your marketing objective, you might have additional components to select. So when you pick Engagement as your objective, you then have to select post engagement, page likes or event responses. Because Instagram doesn’t have events or Pages, your ad will be denied. Pro Tip: Remember, setting up ads is always a trial and error process. However, it’s best if you select your goal to something Instagram can track. It might seem like a silly (and obvious) recommendation, but it’s actually smart to stick to a naming convention for your ad sets and campaign names. While the name of your ad isn’t going to save you money on your CPC or get you more views, it does save time. And if you’re in this industry, it’s critical to always look for ways to organize your audiences and save time for future alterations with your audience campaigns. Saved audiences also help you keep track of what works and what needs help. So for example, US_IG_ENG_RM means you’re targeting users in the US, who use Instagram, speak primarily English and fall under your remarketing campaign. Like we mentioned before, social ads are a trial and error process, so save everything you do to keep your work for later. Before you get started with selecting an audience, it’s smart to scroll ahead in the ads manager tool and choose your placements. This is important because you want to limit any errors on your ads through the process. Selecting your placement lets you actually decide if this is going to Facebook or Instagram. Here you’ll almost always want to select “Edit Placements” over “Automatic Placements.” Why? Automatic placements tends to want to post your ad everywhere. In fact, Shelby Cunningham, a Media Buyer at Sprout Social explained other important benefits to selecting placements. Instead, you want to choose the specific ad type (which we’ll get to further down) and the network. After clicking “Edit Placements,” choose Instagram and whether you’re promoting an Instagram Story or Feed ad. Remember, you can only select mobile devices for Instagram ads. Here you can get a little deeper into your ad placement by picking iOS, Android or both mobile devices. You also have the option to only promote to users who are connected to Wi-Fi. This is ideal if you’re running a lengthier video campaign that might take a lot of data to load. Lastly, you can select broad categories to exclude your ads. 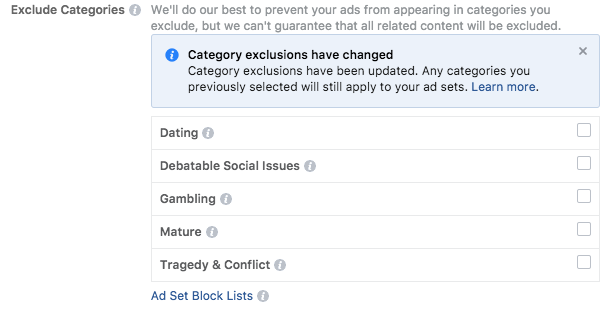 Facebook prevents ads from showing up in these specific categories to prevent showing your brand during an awkward time or inappropriate placement. Your audience is the backbone of your ads. This process is extremely important to narrow down and hone in on your core users. By taking the time to carefully select your audience, you save money by hitting your core audience faster. Locations: Choose or leave out audiences based on extremely specific locations down to postal codes and addresses or by broad areas such as global regions or countries. Age: Select your specific age range (spanning from 13+ to 65+). Gender: Choose between all genders, men or women for your ads. Languages: Only needed if you’re targeting audiences speaking a specific language that is uncommon in that area. Detailed Targeting: Broken into three subcategories: Demographics let you include or exclude people based on life styles, employment and education. Interests filter users based on Pages liked, activities attended and related topics. Behaviors targets purchasing, activities and travel intentions. Connections: Select users who already connected to your app, event or Page. After selecting your audience targeting, the ads manager displays your “Audience Definition” to the right. This will give you insights into whether or not your audience is too specific or broad, the audience details, potential reach and estimated daily reach. The breakdown is extremely broad in its own, which is why you want to again, test on a trial and error basis. Depending on your experience, this dash could mean little or be very helpful. When it comes to Instagram advertising, your budget is completely customizable to your own needs. And that’s important to remember when selecting your bid amount and overall schedule. 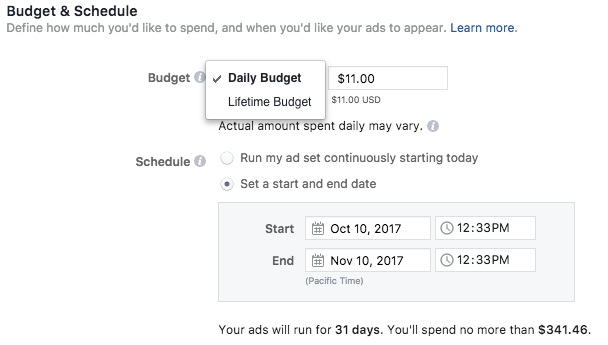 Daily budget: Facebook will spend up to this designated amount delivering your ads every day between your selected campaign dates. Consider this format as a way for Facebook to get the most ads results with your allotted budget. Lifetime budget: This is the total amount you’re willing to spend during the ad campaign set dates. Think of this format as a total set budget for your campaign. This all depends on the timeframe and objective of your campaign. If you launch an evergreen brand awareness campaign, we recommend to choose run my ad continuously starting today. 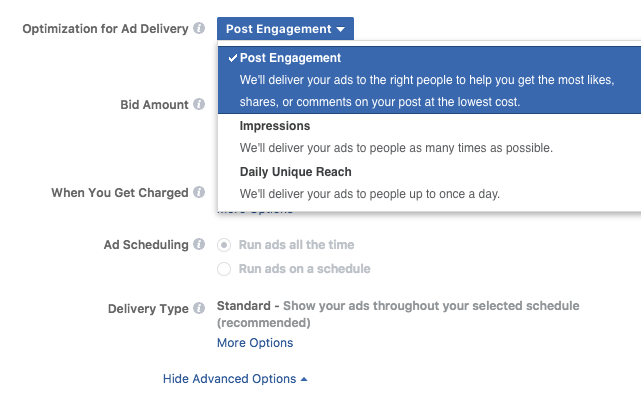 Facebook provides some additional advanced options to help you improve your ad optimization. For Instagram ads, you can optimize the delivery style in case you wanted to display an ad multiple times or just once a day. 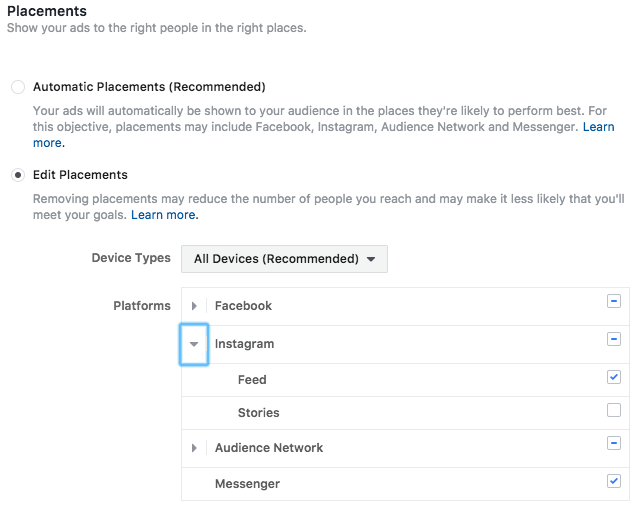 Remember, you want to ensure you complete your placements and choose Instagram before you can edit these options of Post Engagement, Impressions or Daily Unique Reach. Understand that whatever you choose here, you’ll be charged for when that engagement metric occurs. That means if you select Impressions, you’ll be charged for the amount of impressions. However, for Post Engagement, you can select to be charged for impressions or post engagements (likes, comments, etc.). Additionally, you have options for ad scheduling to run continuously or on your schedule. This depends on your earlier selections. Facebook also allows Standard or Accelerated delivery types. The standard option is recommended as it follows your schedule and pace for publishing. However, accelerated will publish frequently and whenever Facebook can push your ad (this is a very costly option). Cunningham told us that standard delivery means you’ll spend evenly throughout the day and it will spread out your budget. Choosing between these two options depends on your experience with Instagram advertising. For new users, it’s likely a better option to select automatic bidding to keep costs low, but still reach your target audience. On the other hand, manual bidding can work with your tight budget more effectively, but there’s a chance your ads won’t reach as many people. 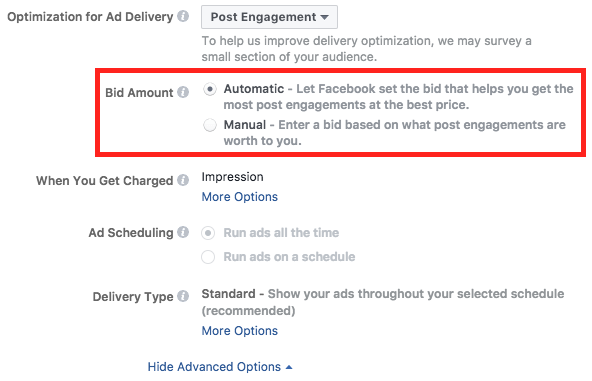 Again, for newer users, it’s a good idea to follow Facebook’s suggested bid for manual bid amounts. This will give you an idea of what you’ll likely pay for the ad to reach the marketing goal you chose earlier. Automatic: This is ideal if you don’t know how much your campaign will cost or how fast you’ll go through the budget. Facebook keeps a balance between low cost ads and getting results. Manual: It’s better to use this bidding type for specific results or metrics you have detailed. 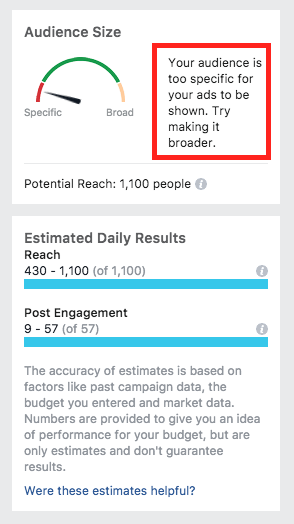 Additionally, this helps you know what Facebook recommends to ultimately let you work with your expected budget. Know that you don’t have to always pick the high end of the recommendation to see the best results. The budget and schedule are set, your audience is narrowed down and now it’s time to choose your Instagram advertising format. If you’re pinching pennies on your ads, it’s smart to carefully select your ad format to get the most out of it. Instagram Carousel Ads allow users to horizontally scroll through multiple images or videos on their mobile device. This ad is valuable for brands wanting to showcase more than one piece of visual content. For example, West Elm uses multiple images to display its various bedding styles. Carousel ads allow users to see more content, ultimately drawing in more engagement per post. In fact, Digiday estimated carousel ads draw 10 times more engagement than single image ads. Pro: Shows multiple images or videos to keep users engaged longer. Con: Run the risk of spending extra on additional visuals that might be skipped by users. While single image ads might not drive as much as engagement as the carousel format, it’s still a reliable source for brands. Facebook allows brands to create up to six ads with the same single image with no extra cost. This means brands can test copy, the call to action and scheduling times with a single image. If you’re working on a smaller campaign, this is a great way to test and save money on a limited content run. If you run a single image ad, make sure the visual you choose will resonate with your audience. Pro: Great for testing copy and CTAs over visuals. Con: Doesn’t drive as much engagement as other formats. Single video ads are a great way to drive engagement while blending in with organic content. Your Instagram video should always make sense without sound and be eye-catching enough to get users to follow through with the content. Microsoft does an amazing job at telling a story with a quick 10-second single Instagram video ad that owns vibrant colors and flashy product shots. This format is perfect for brands wanting to get the most out of their campaign story. Pro: Likely to drive more engagement than a single image and tell your brand story. Con: Can be a costly resource to create, since highly-visual videos tend to drive the most engagement. Instagram slideshow ads are a way for brands to provide a “slideshow” of images with the option of adding music in the background. Simply put, this is images put into a video structure with sound. Slideshows tend to be one of the lesser used ad formats because video continues to grow in popularity. Additionally, setting up a slideshow can be a bit cumbersome, but Facebook does a wonderful job explaining how to start a slideshow here. Pro: Great for users with slow internet connection speeds (loads faster than videos) and shows several pieces of content in one video. Con: This is probably the least-used ad format and takes more time to create than a carousel ad. Instagram Stories has more than 250 million daily users, which actually rivals its main competitor, Snapchat. 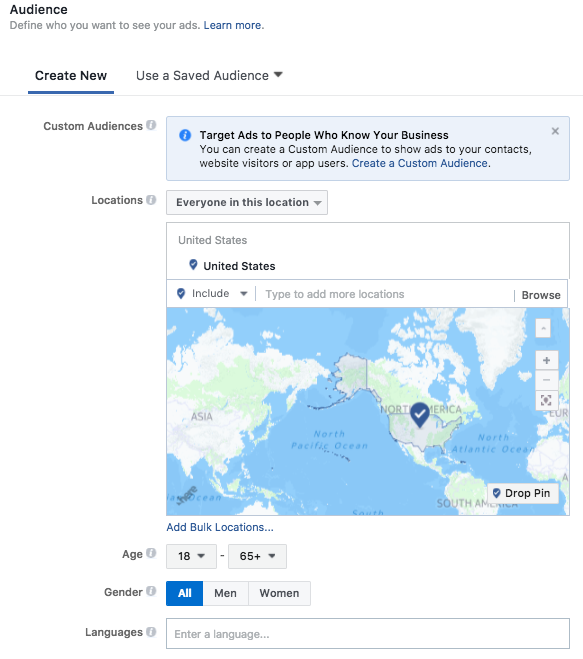 The rapid growth in popularity has advertisers jumping to use this format with Facebook’s ad creation process. Much like single feed images, Stories single images are the same concept. It’s one image that plays for up to 15 seconds between user’s other Instagram Stories. Con: Easy for users to quickly skip pass and can limit your audience targeting. Again, Instagram Stories single video ads are made in the same vein as regular videos. However, you only have up to 15 seconds to convey your message. One of the harder things about ads here is moving from such a quick video to a landing page. 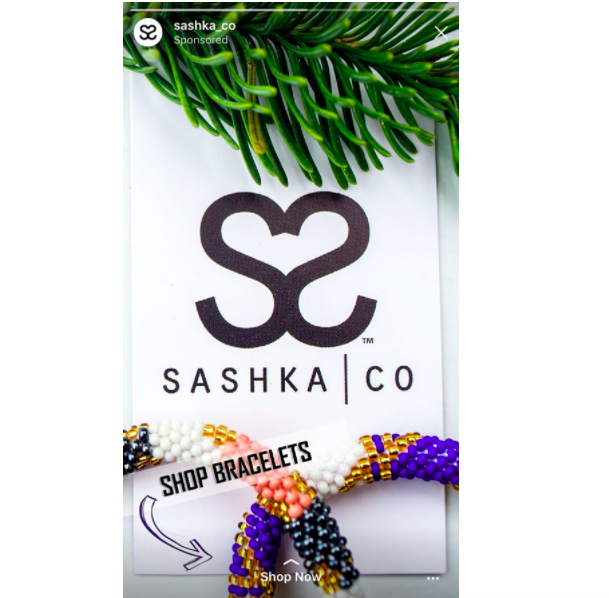 While you can create CTA buttons on Instagram Story videos and images, this format tends to work better for reach than engagement. Pro: Great for telling your story in quick and digestible format. Con: Post engagement is still a little difficult with only 15 seconds to react. Alright–that was a bit of a process. But don’t worry because creating Instagram ads gets easier with experience and testing. However, if you’re here to be a little wiser with budgeting, we’ve got you covered. Like we mentioned earlier, bidding can be a tricky process that tends to get expensive in a hurry. To be on the safe side, begin your Instagram ad campaign with automatic bidding. This will help you stick to your budget and get better results than you would by just guessing. If this is your first time bidding, you’re more likely to underbid or overbid your initial campaigns. When you spend too little or too much, the results aren’t easy to digest and work off for the future. Stick with automated bidding until you get enough tangible data to manually select your bidding. Ad comments are one of best resources to understand the full customer relationship between brands and users. And with Sprout Social, we help you visualize the impact of these comments with our powerful Instagram management tools. 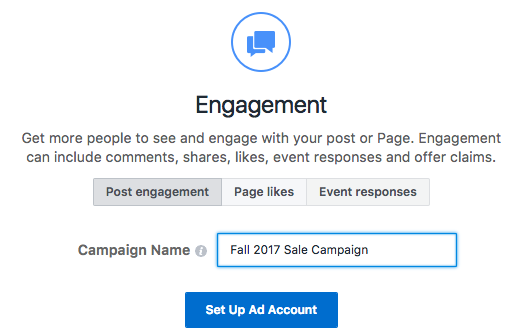 With Sprout, it’s easy to connect your Facebook Ads Account to monitor incoming comments from ads. Additionally, we provide contact details, message history and other info all from the same feed. This makes it easier to know who’s commenting on what content, if they have done so before and with a space to reply directly to users. 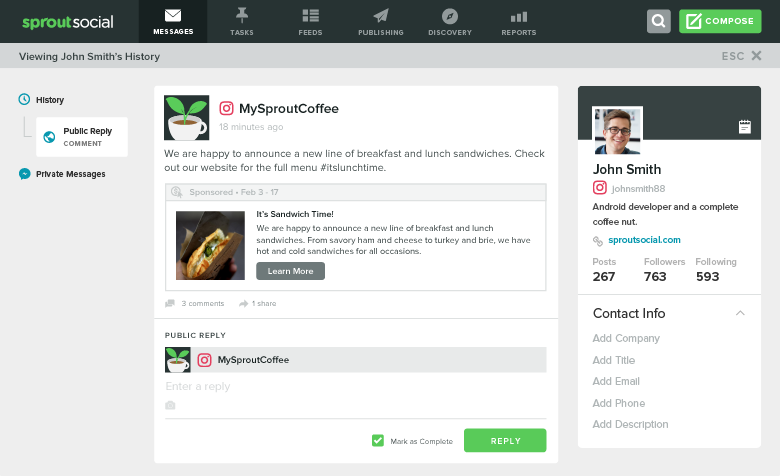 Want more info on how Sprout Social can help your Instagram engagement efforts? Click here for a free demo! Like we mentioned before, Carousel ads are a great way to showcase multiple visuals with a relatively low budget. If your ad caught a user’s attention, give them more to get them to engage and take action. You can use multiple videos or images for this format. Additionally, Facebook Ads Manager makes it easy to see how it will look on mobile devices through its ad preview. Have any tips you’d like to share with Instagram advertising? We’re always listening in the comments! Or feel free to hit us up on Twitter!